One of the more common robbery crimes in recent years have been based on the supposed sale of goods set up on the internet. The crime typically happens along these lines - a buyer and seller make arrangements to sell some merchandise, often on Craigslist. When the parties meet, the presumed buyer robs the seller, usually at gunpoint and the threat of violence. While Elk Grove Police encourage and welcome these internet exchanges to be conducted in front of the police department, no formal policy has been established. EGPD public information officer Jason Jimenez said the department is exploring the establishment of a safe-exchange zone. So how would such a zone look? The Stockton Police Department offers a guide. 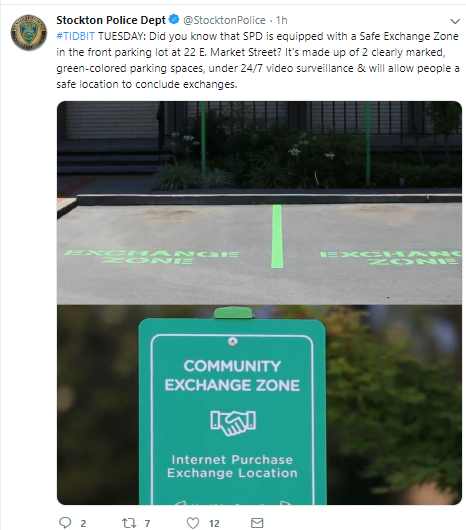 On a Twitter post this morning, the Stockton Police posted information reminding residents to take advantage of what they call community exchange zone. Aside from being in the police department's parking lot, the specified area is under 24 hour video surveillance. Although there will be additional cost for the installation of the cameras, this will help residents - the real purpose of our government - and free police resources. We encourage the EGPD, the city manager, and the city council to make this expenditure for increased resident safety. I am surprised - and disappointed - that Mr. Jordan, the city's Innovation Czar, did not come up with this plan.